These alpaca's fiber has waviness or "crimp" which makes the fiber stand out about the animal like a teddy bear. They are shorn once a year. Learn and share Native American Flute (NAF) techniques, attend workshops, open mic sessions, attend the open mic session after the workshop to practice what you've learned. See http://www.maryyoungblood.com/events.htm for more information. Sorting Method: We do not sort our eggs by size. Our eggs are gathered daily, refrigerated and what you get is what was laid that day. This is why each dozen is an assortment of sizes and colors of green, blue, brown, buff and white eggs. You may find a small egg in your carton every now and then. These are "pullet" eggs. When a young hen first starts laying or after they have molted, the first 4 to 6 weeks, the eggs continue to get larger each day. The pullet eggs are actually the best baking eggs ever! Egg Washing: We do not wash our eggs to keep the protective "bloom" in tact. This is why fresh ranch eggs last longer! NO pesticides: Our chickens are allowed to "free range" for most of the day on 8 acres. They are allowed to go anywhere they want! Pest Control: Chickens are the best "pest control" method we have ever seen! They love the bugs and we love the bugs gone! Plus their eggs are awesome! Fertile vs. non-fertile eggs: They are ALL good to eat! The rooster must be present for an egg to be fertilized. 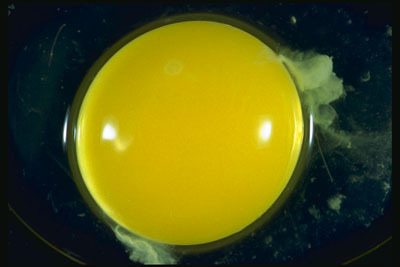 Did you know you can determine if an egg is fertile or not by looking at the germ spot? 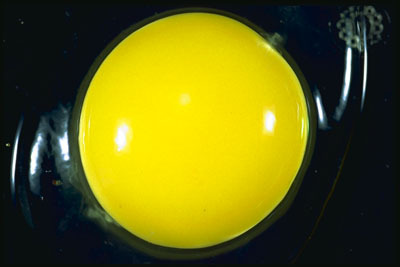 The germ spot is the white spot on the yolk. The non-fertile germ spot contains only the female's cells and looks like a solid white spot. In a fertile egg the germ spot contains both the female and male cells. This allows cells to divide and the spot grows while the rest of the egg is being built in the female's oviduct. Because of this growth the fertile germ spot on the yolk looks like a circle with a somewhat clear center. As long as you collect them every day, you should be fine. They won't develop unless conditions are right... high temps, humidity, etc. It's always possible to get an egg with a little blood spot, but just crack them into a separate bowl before using if you're worried about it. I wouldn't be though. Fertile eggs taste just as good and are just as nutritional!. Cost: To keep our costs at a minimum ($4.00 per dozen), we ask our customers to return unsoiled/non-torn Loping Horse Ranch egg cartons when picking up your next order. Copyright © 2011 ~ LHR ~ All Rights Reserved.